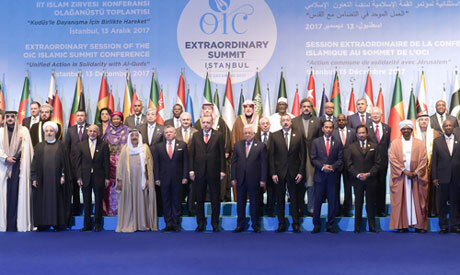 Turkish President Recep Tayyip Erdogan convened in Istanbul an emergency summit of the world's main pan-Islamic body, the Organisation of Islamic Cooperation (OIC), seeking a coordinated response to the recognition by US President Donald Trump of Jerusalem as Israel's capital. With the Islamic world itself mired in division, the summit fell well short of agreeing any concrete sanctions against Israel or the United States. But their final statement declared "East Jerusalem as the capital of the State of Palestine" and invited "all countries to recognise the State of Palestine and East Jerusalem as its occupied capital." They declared Trump's decision "null and void legally" and "a deliberate undermining of all peace efforts" that would give impetus to "extremism and terrorism." Erdogan -- who regards himself a champion of the Palestinian cause -- denounced Israel as a state defined by "occupation" and "terror", in a new diatribe against the Israeli leadership. "With this decision, Israel was rewarded for all the terrorist activities it has carried out. It is Trump who bestowed this award even," said Erdogan, who holds the rotating chairmanship of the OIC. He said all countries who "value international law and fairness" should recognise occupied Jerusalem as the capital of Palestine," saying Islamic countries would "never give up" on this demand. Using unusually strong language, Abbas warned that there could be "no peace or stability" in the Middle East until Jerusalem is recognised as the capital of a Palestinian state. Moreover, he said that with Trump's move the United States had withdrawn itself from a traditional role as the mediator in the search for Mideast peace. "We do not accept any role of the United States in the political process from now on. Because it is completely biased towards Israel," he said. The final statement from the OIC echoed this sentiment, saying Trump's move was "an announcement of the US administration's withdrawal from its role as sponsor of peace" in the Middle East. Abbas slammed the recognition by Trump of Jerusalem as the capital of Israel as a "gift" to the "Zionist movement" as if he "were giving away an American city," adding that Washington no longer had any role to play in the Middle East peace process. Iranian President Hassan Rouhani, Jordanian King Abdullah II and Lebanese President Michel Aoun were among the heads of state present, as well as the emirs of Qatar and Kuwait and presidents of Afghanistan and Indonesia. A surprise guest was Venezuela's leftist President Nicolas Maduro whose country has no significant Muslim population but is a bitter critic of US policy. Trump's announcement last week prompted an outpouring of anger in the Muslim and Arab world, where tens of thousands of people took to the streets to denounce Israel and show solidarity with the Palestinians. The decision sparked protests in Palestinian territories, with six Palestinians killed so far in clashes or Israeli air strikes on Gaza and hundreds wounded. *The story edited by Ahram Online.